There's not too much to say here so I will let the picture do the talking for me. I absolutely LOVE when minimal shoe companies package their product in a minimal fashion, and you can't really do much less in the way of packaging than Unshoes has. The image shows the entirety of the shipment I received: one pair of custom made huaraches and one cardboard band with a logo on it holding them together. Bravo for not wasting a box or even worse, a plastic bag for one pair of huaraches. As I got the shoes unwrapped, I was drawn immediately to the Vibram sole, which is the heart of any good pair of huaraches. The Unshoes website states that the material is 5mm thick, which is a good middle of the road thickness. What I mean is this, there are companies that make a thinner soled huarache and there are companies that make huaraches with much thicker soles. 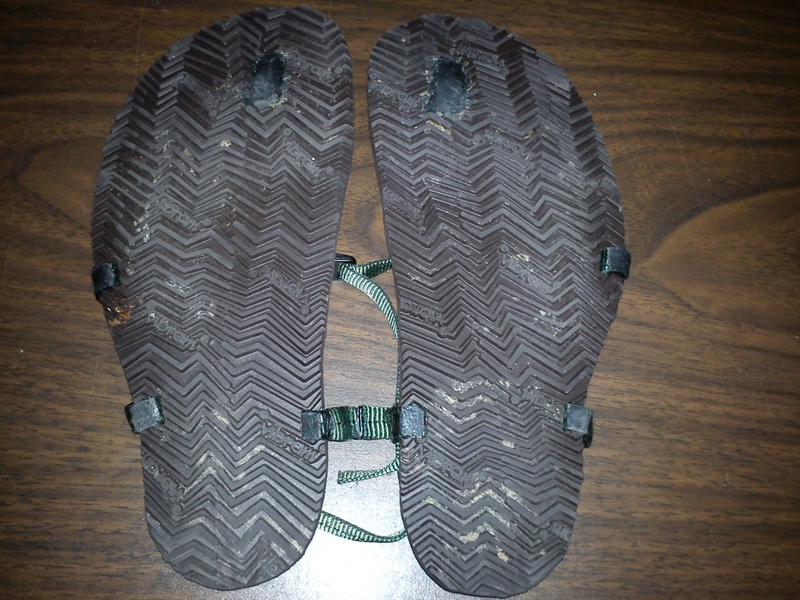 Unshoes has seemingly designed the Wokova Feather to be more of a multipurpose sandal than strictly an off road (such as Luna is making now) or the prize winner for barefoot ground feel (which to me is the 4mm Connect from Invisible Shoes). The major standout feature of the sole of the Unshoes was the sheer amount of traction that the tread pattern should be able to provide. 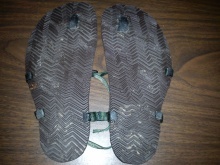 The tread is aggressive and seems to cover the area of the sole more completely than any sandal I have worn to date. All I had left to do now was to flip the sandal over and check out the strapping system and the fit. As I mentioned earlier, all of the Wokova Feather sandals are custom made for each owner. 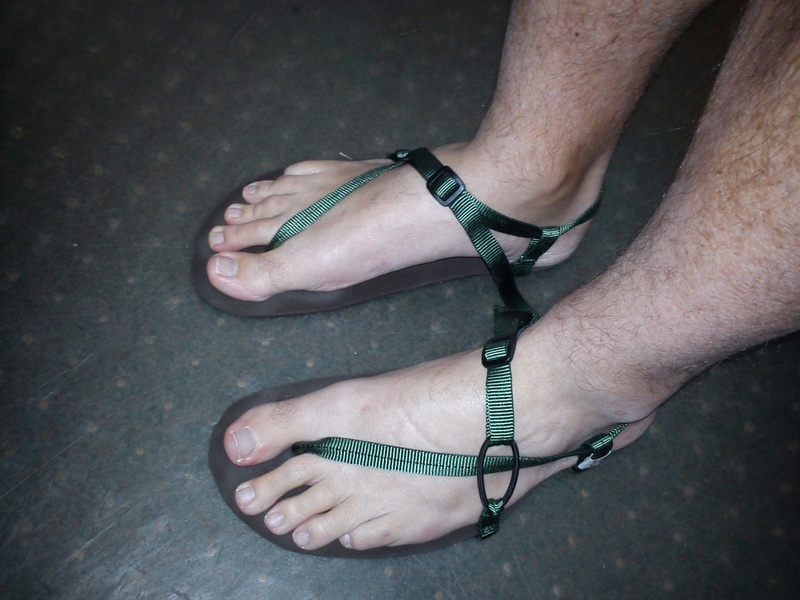 I provided Unshoes with a tracing of each foot that included the location where I wanted the strap between the toes. I went one step further and asked them to trim the sole material close to my foot shape because my main focus was going to be running and I didn't want them to flop around. I slid each foot in and could even before I had adjusted the straps that there had been a great attention to detail, and that the sketches had been followed exactly. 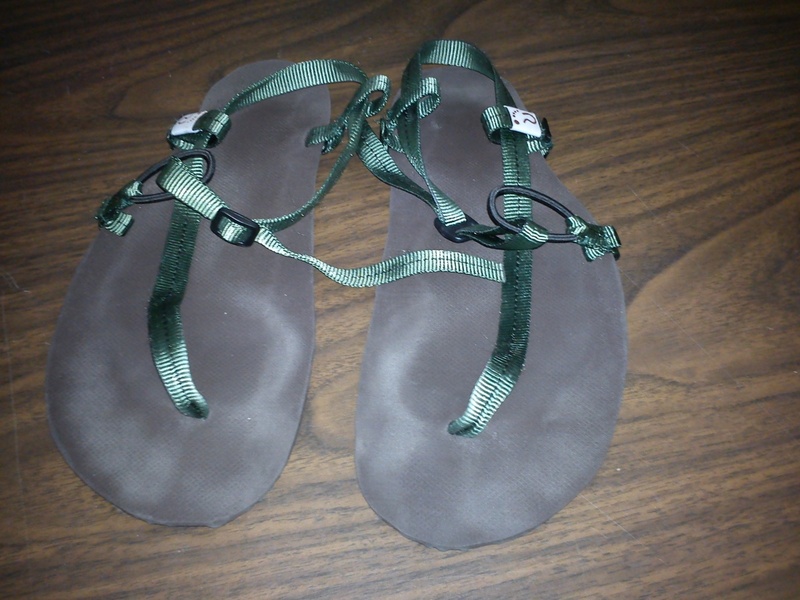 I was very impressed because I am a bit of a control freak with the fit of my sandals and was a little wary to allow someone else to make them custom for me. All my concerns were for naught and they simply fit perfectly. Adjusting the straps or laces on a new pair of huaraches is usually a bit of an adventure, and that rang true with the Wokova Feathers. This certainly shouldn't be taken as a negative, but as a simple fact that goes along with running in huaraches. The fit is very custom and it takes work to get any make or model tied correctly. The criteria that I judge a pair of huaraches on is how long it takes to adjust and how long the laces stay in one place without re-adjustment. The Unshoes were extremely simple to adjust. I had them on my feet and ready to run in about 5 minutes. The elastic loop in the strapping system really helps speed up the adjustment process. Why does it help so much? It allows for a little bit of “give” in the straps where a static lace is either too tight, too loose, or just right. The only way to get to just right with a static lace is trial and error, where the Wokova Feather feels just right literally almost the first time you snug down the straps and lock them in place with the buckle. Finally, I have to mention appearance. These are hands down the best looking (read: most main stream acceptable) huaraches I have seen to date. They look like a super streamlined version of something from Chaco or Teva. My wife gets a little bit touchy about me wearing a lace based pair of huaraches around in public and my 6 year old male cousin even asked why I was wearing girl shoes. This will not be a problem with the Unshoes, my wife is quite impressed by the appearance. For any of you that have had similar concerns, the Wokova Feathers are the “Everyman's Huaraches”. I waited for a nice sunny day to go on my first 5k in the Unshoes. Huaraches are so much more pleasurable in the nice warm sun and I didn't want foul weather to taint my first impression. I set out on a moderately hilly route so that I could really get a feel for how that magical elastic band would perform when it had the stresses of ascending and descending curvy roads. What I found really impressed me. The tiny bit of give in the straps was hardly noticeable, I had assumed that it may make things feel a bit ambiguous and unstable at times. I have run so many miles in static laced huaraches that I was completely comfortable with what a well adjusted sandal was supposed to feel like. The Wokova Feather felt almost exactly the same! I will state that I laced them pretty tight for running so there wasn't a whole lot of give left in the elastic ring and that I did loosen them up for casual wear which allowed them to be much less rigid and very comfortable to walk around in. Moral of this: the way you adjust them is directly related to overall comfort which can only be found out through experimentation. My only other concern was how the 5mm Vibram material would translate ground feel. I was happy to find that they are on the very transmissive side of the spectrum and fell pretty much right in between my 4mm and 6mm Invisible Shoes in terms of overall ground feel, leaning closer to the feel of the 4mm model. This means that you feel everything and it hurts to step on sharp things. Beginners who haven't spent much time in an ultra-minimal shoe will be ecstatic, and people like me that pretty much live in huaraches will be thoroughly impressed but will realize there are more minimal choices. The Unshoes Wokova Feathers are in my opinion really the first affordable, custom-made, mainstream acceptable pair of huaraches on the market. They are in essence the SUV of huaraches and they do everything well enough for 99% of the minimal shoe buyers out there today. I can't wait for warmer weather so that I can run in them, hike in them, and wear them to the supermarket without 6 year old little boys asking me why I'm wearing girl shoes.